I've been lucky enough this year to have time to experiment with my printmaking while on a sabbatical from my teaching job and helping my Dad adjust to his alzheimers diagnosis. Experimenting, although an essential part of any creative practice can sometimes feel like a displacement activity. I find it's easy to get motivated to play endlessly with the possibilities of a particular technique but much harder to knuckle down to working on finished images with the problems they inevitably throw up. This blog is largely intended to document these experiments so I can remember the trials and tribulations and to share what I've found out. Creating unusual freeform textures on metal plates is something which I've been experimenting with since my MA ten years ago and I'm particularly interested in the accidental processes which remove control from me (a good thing for those with perfectionist tendencies). I'm still learning to be more curious and relaxed about the process of creative discovery without jumping forward to the inevitable question 'but where is this all going? '.....the artists equivalent of 'are we there yet?' The etching process lends itself really well to the discovery of happy accidents if you're not overly concerned with documenting timings and following a specific sequences and adopt a more experimental approach. Every now and then I return to work on an ongoing series of 'fragments' prints which combine natural textures and accidental trails in metal with figurative imagery based around seascapes and topography of the coastal landscape. The marbling texture I was aiming for was intended to record the natural movement of water and create plates which could add to the collection I use to make the 'fragments' prints from. 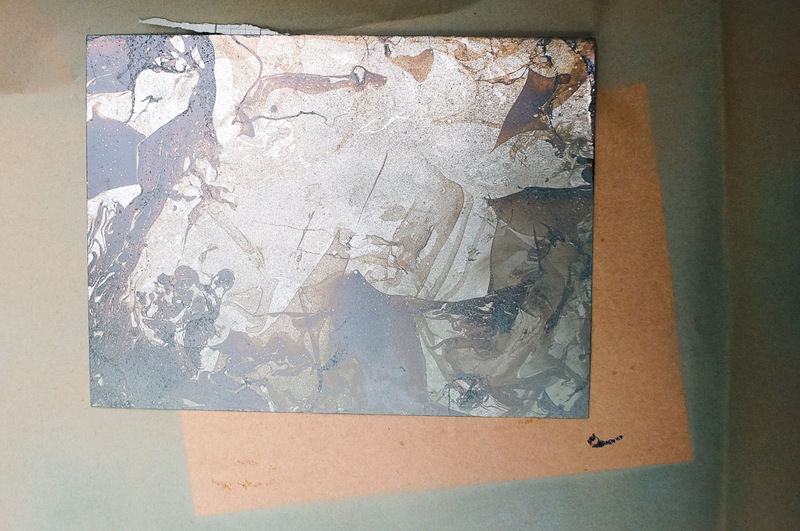 As it turned out, a bit like normal marbling on paper, marbled etch plates are really straightforward. After degreasing some small zinc plates (roofing zinc from a metal supermarket) I simply put the plate in a tray of water and poured stop out varnish onto the water surface while rocking the tray gently to create motion. The ripples dispersed the stop out into pleasing patterns which sat on the surface of the water as a film. Using gloves, otherwise the stop out sticks to your hands, I then lifted the plate through the stop out several times and left it to dry on the hot plate to harden and dispel any water from the surface of the zinc plate which will stop it from sticking. 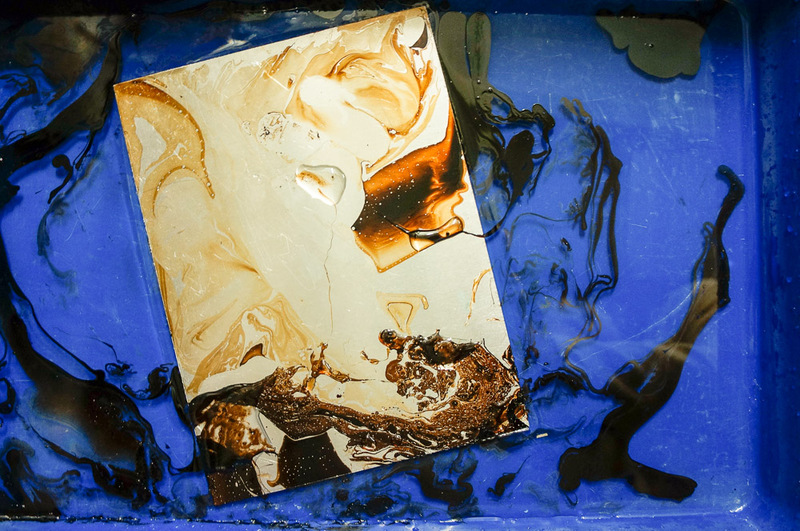 The varnish forms a film which can be manipulated while there's still water on it. Once dry I took the plate outside and used plasticote spray paint to go over the surface with a fine layer or two of paint which acts as an aquatint and taped the back of the plate to protect it before submerging in the acid bath. I etched it in a 1:8 nitric acid bath for around 10 minutes, then rinsed, filed the edges, inked and printed the trials. On reflection I'm happy with the details of the water and varnish movement which were recorded but probably would use a bit less as it coated the plate across the whole surface and may have been letter if larger areas of the plate were uncoated. I'd also experiment more with the spray paint aquatint to get larger areas of darker tone for balance. Overall this is a technique I'll use again.